Beyond Concrete Part 3: Examples of great park design from DFW and North America. With help from New Line & SPA Skateparks, we collected examples that illustrate the potential of great skatepark design from their portfolio of work. Arlington's Vandergriff Skatepark, with city branding and repurposed benches in the background. Before the park was built, skaters used these benches for tricks. Arlington's Vandergriff , with its winding, open ended 'snake run' surrounded by mature trees and natural park land cuts a stunning figure with a skater in flight, and this unique feature regularly features on locals favorite list. Arlington's Vandergriff Skatepark, photo by drone. This park is the largest and most centrally located of the multiple parks included in Arlington's 10 Year Skatepark Master Plan. This park is a regional magnet drawing skaters from around the metroplex. 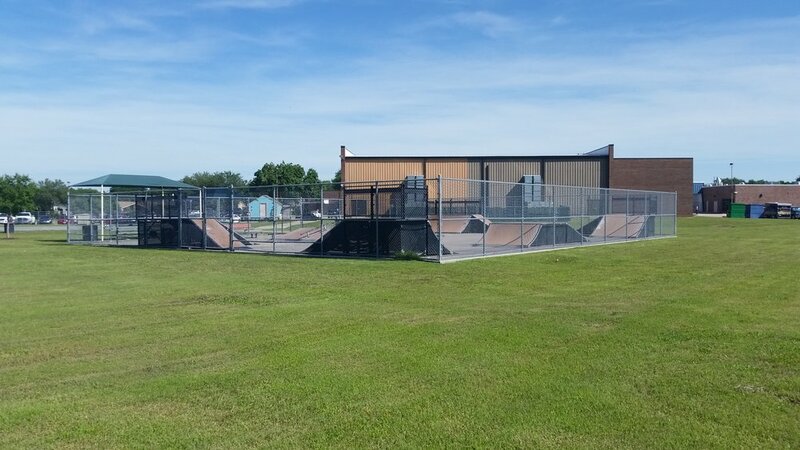 The Colony, TX Before & After -- from modular skate ramp park to beautiful facility completed cost effectively. The Colony, like Dallas' own St. Francis skatepark was a fenced in modular ramp park that was uninspired and not a true asset to the whole community. Working with New Line / SPA, The Colony reused its existing concrete slab to gain cost efficiencies, and designed a beautiful park. They were able to expand the park to about 12,000 sqft as part of this redesign, and incorporate local attributes like the sailboat to indicate the proximity to the lake. This drone photo was taken before completion of construction. The redesigned park opened December 16, 2017. Northeast Community Park, in Frisco, Texas is the largest park in DFW to date, at 47,000 square feet. The park opened in August 2017 and this grand opening celebration was hosted by the City's Parks & Recreation Dept with hundreds in attendance. The park features numerous innovative sculptural features. Hundreds celebrate Frisco's skatepark in August 2017. Frisco's skatepark includes shaded areas to gather and hang out with friends. McKinney Skatepark overview shows the incorporation of safe spectator zones, shade elements and terrain features for various interests and skill levels included in a single facility. Roanoke Skatepark in Roanoke, TX. The City's slogan "Unique Dining Capital of Texas" is reflected within the skatepark features - a cantilevered spoon, metal knife rail, black & white checkered (diner) pool tile. 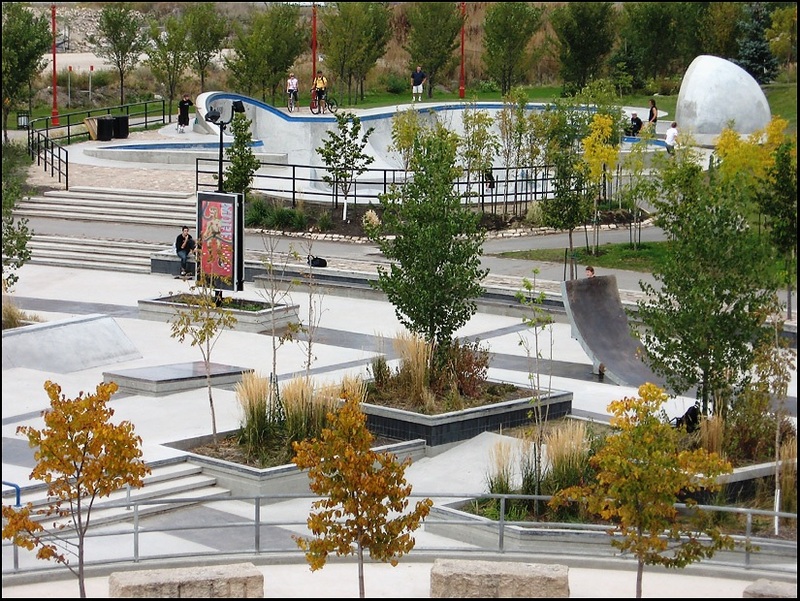 Plaza at the Forks Skatepark in Winnepeg, Canada - An strong example of world-class street and bowl terrain integrated with colour, texture, art, landscaping, and inviting viewing areas. This park has attracted world class skaters to Winnepeg to enjoy its unique design. Be sure to check out the image of the park when it is full of skaters. That is a beautiful skatepark! Ed Benedict Skate Plaza in Portland, Oregon - Water Droplet manual pad and gap. River rock in gap collects storm water and directs to planted areas within park. UBC Campus Skatepark, British Columbia, Canada is the first skatepark on a university campus in North America. Concrete and Steel skateable books sculpture - a signature feature created with input from the local community. The university emphasized the community input into the design process and it shows. Vancouver's Surrey BC Skatepark is transit accessible, and adjacent to an existing recreation center. This center shares many attributes with Dallas' planned location at Bachman Lake, with existing DART transit access, trail access, as well as an existing recreation facility. Maybe we should take a trip to Vancouver and check it out!